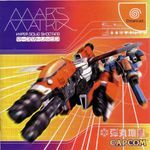 Mars Matrix is a top down vertically scrolling 'shoot em up' developed by the Japanese developer Takumi and published by Capcom originally for the arcade, but later for the Dreamcast. The arcade game ran on the CPS2 hardware platform and notably only uses one button to control its various attacks. For the Dreamcast port, the game was enhanced with a cash bank system where money was earned in-game which could be later spent on unlocking additional features, modes and tweaks to the gameplay (e.g. more credits etc).